In today's post about payoneer, you will be learning how to transfer money from your payoneer account to another payoneer account using simpler and easy method provided here. Our stats shows that there are always new visitors every blessed day in this blog and that signifies that, there are new persons that are coming across this post for the very first time. Although if you have been following our post on the trend "payoneer online account" it means you will flow with steps provided. But to take every new person along, check below. Payoneer is all about an online payment account that accesses you to create s free U.S account from anywhere you found your self as in any country. 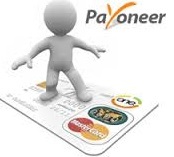 With payoneer account, you can be able to receive and make payments in dollars or pounds. The money you have in your payoneer account can be converted to cash from any ATM machine. So it implies that you can always withdraw your cash from any ATM with a payoneer Prepaid MasterCard that has their logo boldly written on it. The card is entitled to every payoneer account user for free. It means once you create account with payoneer and provide an alternate address, the card will be shipped to you for free of charge. 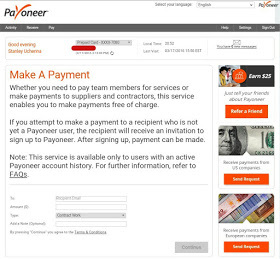 √ Recommending you to check How to register for payoneer account for free here. Payoneer being an online e-currency company, having the likes of Webmoney, Paypal, payza etc formally, it used to support transferring money to PayPal online account and as well the likes. But currently as it stands they have put to an end such transaction having the reasons best known to them. it used to be like before, one getting Paypal account verified easily using any of his/her working payoneer online account, But not like that any more. Like I said earlier the reason is best known to them for such alteration. Now, the situation has been, as a user of payoneer account, you have tried and were not able to make a success in your transaction from your payoneer account to paypal account, in other words, for me to make a good exchange rate from other third party exchangers that receives payoneer dollars, I had to come up with a means that worked very well for me, which is transferring from my payoneer to other payoneer accounts. If you have an account with payoneer, that which am talking of has its features embedded in the dashboard, so every one can access it in his/her account there. ==> First, You have to get your own payoneer account by creating one from here. And by mere doing that you stand a chance of getting free $25 from payoneer. ==> When you must have signed up, Do ensure that your MasterCard for that account is active and working well. Because accounts with espired or outdated MasterCards can't receive or send any payment. ==> Time to login into your account on payoneer, when you login, on the left top corner of your screen, click on the "Pay" button. Then you will see drop down which will display. Click on "Make a Payment" and a page where to put details of the account you are sending the money will show. That's it. ==> On the side of options to fill in details of the account you are sending the money to, in "To" space, put the email address of that account you are sending the money to. Also enter along the amount you wish to send the person. Also with the reason why you are making such transfer( although you can leave it empty since it is not mandatory.) then click on "Continue"
==>Next, is to Confirm the payment by clicking on the option with name "Approve Payment" and trust me you are good to go, that's all. Now you will receive two mails, the first is notification from payoneer saying they have received your order to to make transfer. And the other which is the second message, will be a confirmation message indicating that the money has been transferred to the recipient. 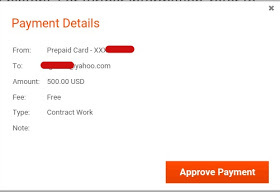 Below is How To Receive Money From Other Payoneer users. Since we are done with how to transfer money to another payoneer account above, Next is to go in details of how to receive money from other payoneer account users. ==> First, You have to get your own payoneer account by creating one from here and by mere doing that you stand a chance of getting free $25 from payoneer. ==> When you must have signed up, Do ensure that your MasterCard for that account is active and working well. Because accounts with expired or outdated MasterCards can't receive or send any payment. ==> You should send your email address the one attached to your online payoneer account to the person that wants to send you the money and by doing that, also ask them to follow the above guide on this post in order to send you the fund easily and fast. ==> When they must have send it, a notification on that should also get to your mailbox as well as them too. But yours should be like a notification saying the exact amount sent to you. Note: It doesn't take much of time to reflect the amount being sent on your account balance. it's works instantly. Hey but most times, you may have to wait for about 2 to more hours.That's all but if you really don't want to follow the above steps provided, you can also use the payoneer "request a payment" which can be found at the top left corner of the device's screen you are using, which is under the "Receive" tab. ==> Transfer is completely free as no charge is attached to it. ==>The maximum amount which you can recieve in a period of 30 days is $15,000. ==>Also for the Maximum amount which you can send within 30days is $10,000. That's all for payoneer account fund transfer. If you have any question regarding to this post or all that concerns Payoneer online bank account, kindly use the comment box below for that.